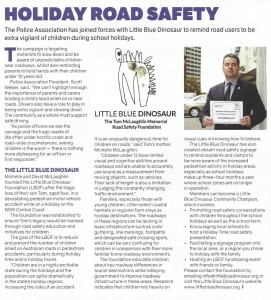 The media play an important role in spreading the road safety messages of the Little Blue Dinosaur Foundation. You can receive live updates on our work through Facebook, Twitter and YouTube. For all media enquiries, please contact our office. Michelle McLaughlin is a nurse and mother who became a road safety campaigner after the death of her four year old son Tom last year. She speaks about the pain of losing a child and questions whether the media can be too invasive in the aftermath of a family tragedy. 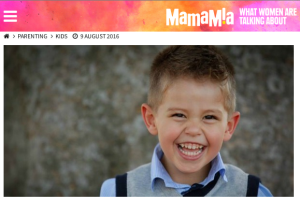 Mamamia’s Rachel Curtis interviews Michelle on how her personal tragedy led to the creation of the Little Blue Dinosaur in 2014. 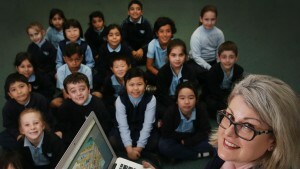 Michelle discusses differing roadways, the importance of holding children’s hands and the launch of Out and About With Sophie and Tom – an online activity educating children on holiday time road safety. The parents of a little boy who lost his life after being hit by a car have helped create a new interactive website to teach primary school students vital road safety skills. The Transport for NSW “Safety Town” program is being made available to all half a million students from Kindergarten to year six in more than 2300 primary schools across NSW. The Out and About with Sophie and Tom — Safe Holiday Adventures activity focuses on different road environments kids might encounter when on holidays. During the Summer 2016/17 campaign, LBDF added the Mornington Peninsula to the Victorian chapter of their road safety campaign. The Peninsula’s Holiday Time campaign will be the largest in Victoria, with 168 signs and five overpass banners installed throughout the shire. A further 400 wristbands and bumper stickers were distributed from shire officers and around the Rosebud foreshore campaign grounds. 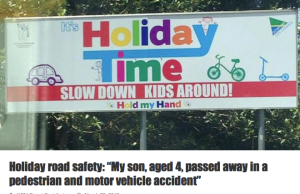 As a popular holiday destination in South Australia, Limestone Coast Council area’s have been provided with packages including large signs, stickers and promotional gear to remind everyone about the importance of road safety in the area over the summer holidays. 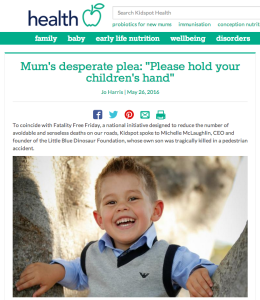 South Australia has become the fourth state in Australia to promote the Little Blue Dinosaur’s “Holiday Time” campaign in seasonally popular areas. 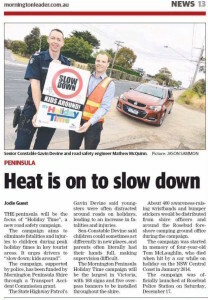 Michelle & David McLaughlin have been working with the Limestone Coast Local Government Association (LCLGA) Road Safety Program and visited Mount Gambier last week to launch their campaign across the South Australia coastline. The key focus of the organisation is a holiday period signage program that will start operating in the area over the 2016/17 summer school holidays. The NSW Police Association has joined forces with the Little Blue Dinosaur to remind road users to be extra vigilant during the recent school holidays. 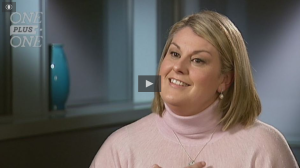 Michelle sits down with Jo at Kidspot to discuss Tom’s tragic accident in 2014 and how the Little Blue Dinosaur is pioneering for change with holiday-focused road safety education for children. 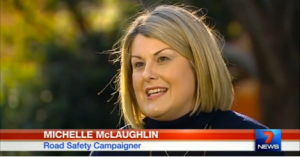 Michelle highlights the need for the community to address road safety as the statistics continue to increase against the same period last year. 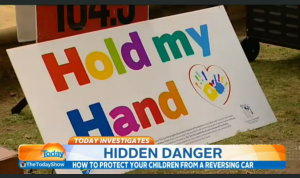 She reiterates that holding your child’s hand near the road could save their life. “Shellharbour has become the latest council in Australia to support the Little Blue Dinosaur Foundation’s pedestrian safety program. 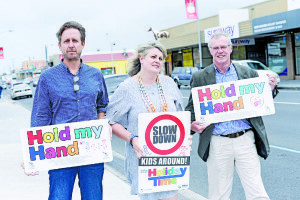 “Mayor Marianne Saliba said the welfare of children is the focus of the Christmas road safety initiative being implemented in high traffic tourism areas in Shellharbour City. 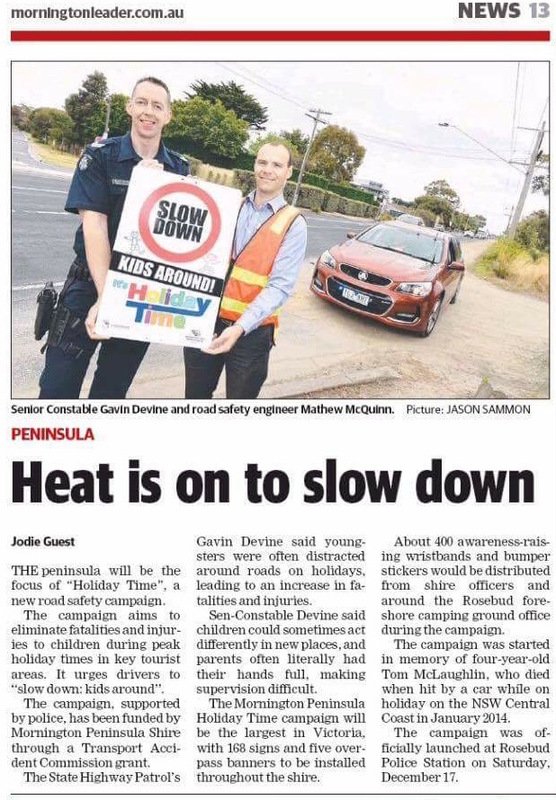 “This road safety warning is a timely reminder to everyone during the summer holidays, when people are often more relaxed and complacent than usual,’’ Cr Saliba said. 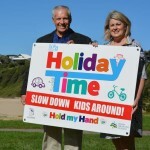 The Little Blue Dinosaur ‘Holiday Time: Slow Down, Kids Around’ campaign has been expanded to the Kiama municipality. 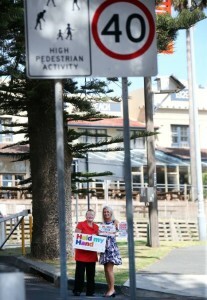 In Kiama and Gerroa holiday parks, signs will be erected to target key tourist areas where holiday periods result in increased pedestrian foot traffic and a greater number of vehicles. 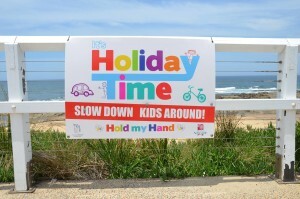 The ‘Holiday Time’ campaign spread to Newcastle and Lake Macquarie in the 2015/16 summer school holidays, with signage installations from Bar Beach to Merewether and across to Warners Bay Foreshore. Daily radio announcements were broadcast to remind listeners that children are out and about in the community in increased numbers during school holidays. Daily radio announcements were broadcast to remind listeners that children are out and about in the community in increased numbers during school holidays. inaccurate reporting of facts and sensationalised journalism had on the McLaughlin family. The article suggests appropriate ways for journalists to respectfully approach families during such a sensitive time. The Walkley Magazine’s core aim is to encourage and inspire excellence in journalism, highlighting the industry’s finest and providing insight into how journalist’s can improve their methods. Children are our most vulnerable road user group and the Little Blue Dinosaur is working in the space of pedestrian roadway safety for children to enhance the protection of them when they’re on or near roadways. “A road doesn’t have to be busy, to be dangerous”, David McLaughlin explains. The Little Blue Dinosaur Foundation sits down with blogger Franki Hobson to discuss ‘5 Kids’ Bike Safety Rules Parents Should Teach’. 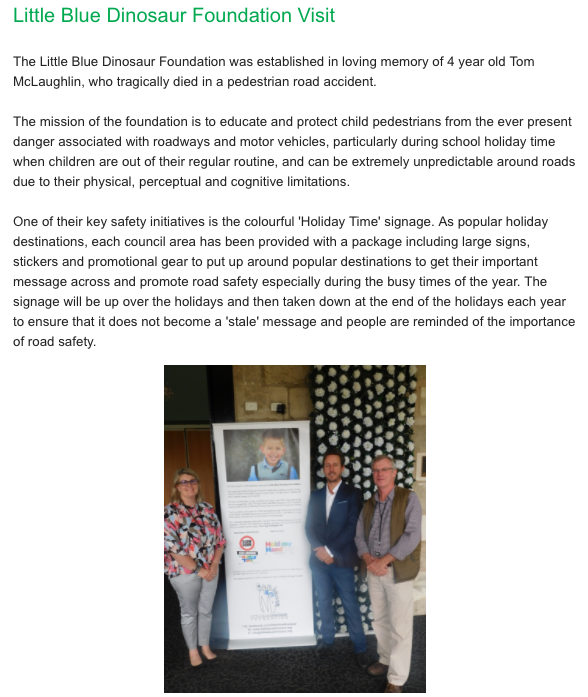 The Little Blue Dinosaur Foundation joined the Global Alliance of NGOs for Road Safety in May 2016 to discuss children’s road safety on an international level. The Global Alliance was formed in 2012 out of the UN’s Road Safety Collaboration and includes over 140 organisations from more than 70 countries with the purpose of lobbying for and implementing road safety initiatives globally. After years of decreasing numbers, 2015 has seen a spike in the death toll on Australian roads, concerning the police and various community groups. The Little Blue Dinosaur Foundation is actively campaigning to assist in reducing these numbers through road safety education for children, parents and motorists. The aim of the Australian Road Safety Foundation’s campaign is to set a target of achieving zero deaths on Australian roads, starting with a singular Fatality Free Friday. 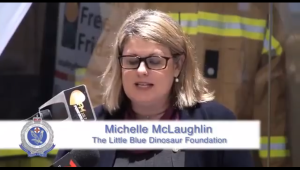 Michelle spoke about the personal loss of her son, Tom, and how the Little Blue Dinosaur Foundation is helping to reduce child fatalities on our roadways. Holidays are an exciting time for families, but different roadway environments lacking in infrastructure can sometimes be confusing for children who already have limited cognitive abilities on or near our roads. This is why it is important to always HOLD HANDS (until age 10) and have a daily conversation about roadway safety. 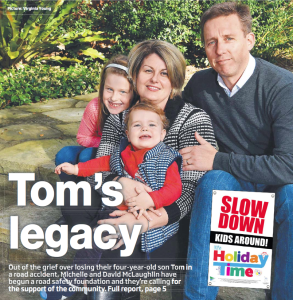 Michelle & David discuss the loss of their son, Tom, urging motorists to take particular care when driving during the school holiday periods, where children are outside of their normal routine and environment, significantly raising the risk profile. 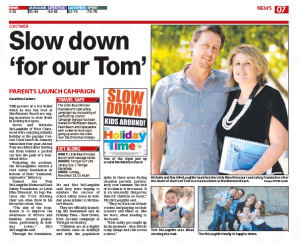 Out of the grief over losing their four-year-old son Tom in a pedestrian motor vehicle accident, Michelle and David McLaughlin have begun a road safety foundation and they’re calling on the support of the community.